One of the best things about our location is the endless amount of walks you can do nearby. 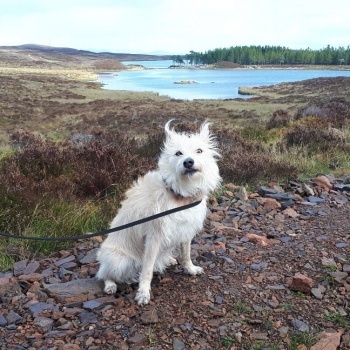 This morning we decided to drive 10 minutes to near Beauly to do Loch nam Bonnoch (courtesy of WalkHighlands). 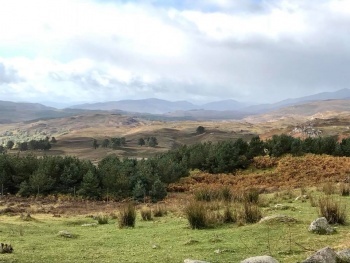 This is a 4 miles / 6.5 km walk, mainly flat but with stunning, incredible views. You can make the walk much longer too by exploring the myriad of forestry paths. This is a very quiet and little known trek! In wet weather, some of the paths can be muddy. It can be quite hard to park to start the walk, but our Walks Near & Far folder in the Steading will give you good advice on this. Most of the uphill is at the start, but you are rewarded behind you, with views back to the Beauly Firth. On taking the first corner uphill, you will be stopped in your tracks with the view over towards the easterly peaks of the Glen Affric and Strathfarrar mountains. You wouldn’t believe you are only a few miles from Beauly when you see the remote and rugged view ahead of you. 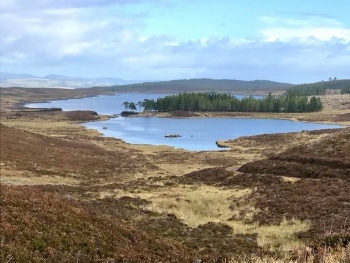 Continuing along the track you will soon get your first glimpse of Loch nam Bonnach – a very peaceful stretch of water hidden amongst the lower moors. You will see Ben Wyvis looking behind the loch. You then enter a forestry area before continuing into a little fairy glen with a river alongside. After crossing a stile, you are now heading back towards the start. It is preferred you keep dogs on a lead for this walk, mainly because there is often deer about. Today we saw a whole herd just as we were walking past the loch. We’re letting you into this little known secret walk, but sssh, keep it to yourself please! 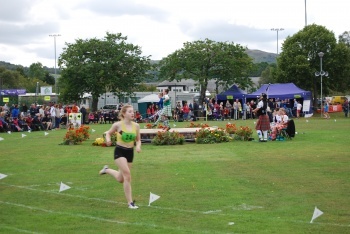 Every summer throughout Scotland there are a host of Highland Games to visit! Highland Games are iconically Scottish. They are amazing events to celebrate and bear witness to the fabled skill, strength and endurance of the Highlander. Wherever the Games are held, each has its own local character and traditions. This is a cracking day out for the family. There are lots of track and field games that everyone can sign up for and enter. But the main event is the traditional Heavy athletic events like the caber toss, shot put and hammer throw when serious athletes compete to be champion. What a spectacle to watch the bravest warriors. There are always Highland dance competitions, bagpipes and lots of family activities. The Games are a spectacle like no other. Some of the events take place against amazing scenic Scottish backdrops too. Our favourite event is the caber toss which has come to symbolise the Highland Games. The Games wouldn’t be complete without it! A full-length log of Scottish pine can range between 16-22 feet, and the weight can vary from 100-180 pounds. 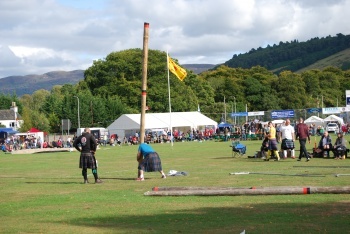 It is stood upright and lifted by the competitor using both hands under the bottom of the caber. They then rest it against their body, before running forward and tossing the caber into the air. The aim is that it turns end over end in the air before hitting the ground. Contrary to popular belief, the caber toss is not about distance – it’s all about the position and how it lands. Picture a clock face, and place the caber thrower at 6 o’clock. The aim is to have enough strength and control to make the caber land at 12 o’clock exactly. And the closer the better! 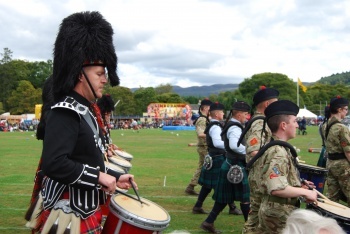 This year, we visited the Games at Drumnadrochit right next to Loch Ness. Just a 20 minutes drive. There were some fairground rides, local craft and art stalls, and food tents. We had such fun watching the Heavy events, the Highland Dancing competition and the piping bands. It only cost £15 entry for a family of 4. Other Games in easy driving distance of Pinewood include Strathconon, Tain, Inverness Forres, Dornoch, Strathpeffer, and Nairn, to name a few. 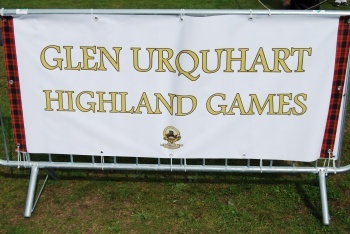 To see a list of events, check out the SHGA (Scottish Highland Games Association) website or Visit Scotland. 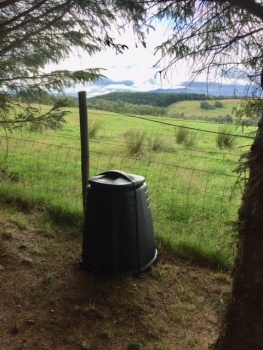 Just a short blog post to say our new composting bins have arrived – yay! We have two – one in the enclosed garden for my compost from the veg gardens and the house; and one by the Steading for our guests to use. All veg and fruit waste can be composted, coffee grounds and tea bags, old bread, leftover pasta, pizza crusts, and even egg shells. Guests also have a small kitchen compost bin inside the Steading which they can put their waste into first, before taking outside. We are excited to have implemented one more small measure towards reducing the waste at Pinewood. And who knows – in a few month’s time, we may have our own compost to put on the veg gardens too! 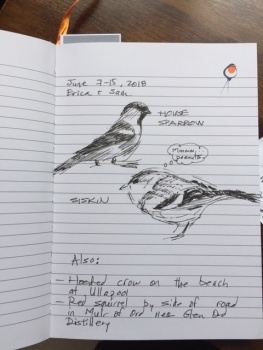 Another small Green Tourism addition is our new Nature Diary. This helps our guests capture their wildlife experiences and sightings, both near and away from the Steading. So far there have been a few entries and even some pictures drawn! 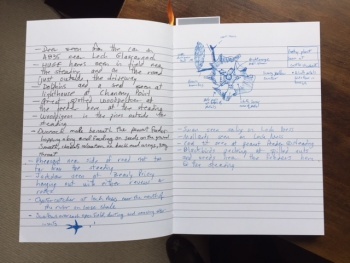 It really is good fun to see what the guests have seen and where – and this may help future guests see the wildlife too. From dolphins to red squirrels. Hooded crows to house sparrows. Greater spotted woodpeckers to robins. Highland cows and sheep of course! Golden eagles to whales! Pheasants, jackdaws and oyster catchers. Hares, deer and swallows. All these little measures are all big actions in support of our Green Policy.